What is your favorite brewing topic to talk to customers about? Really, I love to talk about any topic. Brettanomyces, Lactobacillus, Pediococcus and their roles in sour beer top the chart. I also enjoy barrel aging, clean or sour, and barrel maintenance. I have a horticulture background, so any time people want to talk about unusual grains or herbs, I am game. What was your biggest brewing blunder? Accidentally adding a pack of Brett. Lambicus to my yeast starter for a Russian Imperial Stout. Had two starters going for two different beers and made the cardinal sin of having one too many on brew day. It was not until I went to pitch the Brett starter that I realized it was just wort. The RIS went down the drain a few months later. What movie have you watched the most times? Star Wars Empire Strikes Back, and anything with Milla Jovovich. Seriously she is awesome, Return to the Blue Lagoon, Kuffs, The Fifth Element, Ultraviolet to name a few. My wife gets upset if we watch too many in a row. 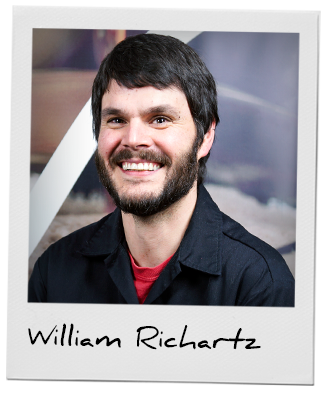 What was the proudest moment in your fermentation history? Traditional blended Kriek. Years to make, pounds and pounds of cherries and then it was gone in no time. My first time in New Zealand I collected some spontaneous wild cultures and currently have a few batches of beers going from that. Hopefully, that become my proudest moment if they turn out. So far so good. Why do you brew? At one point in my life, I wanted to be a chef. I grew up watching all the great cooking shows on PBS. Yeah PBS, there was no Food Network or Cooking channel. I find that brewing is a great way to satisfy that same creative process, plus you get beer in the end. When did you start brewing? I believe it was 2010, shortly after buying a house. I finally had room to brew! What is your brewing system? A pretty simple 18-gallon kettle that I made into an electric kettle with the classic 10-gallon cooler, immersion chiller, and elbow grease. I think most people would be surprised to see my system, very basic. Oh, not to mention my notebook, refractometer, pH meter and my two cats that are WAY too much help. What is your favorite style of beer for drinking and for brewing? Munich Helles, German Pils, and anything Farmhouse or sour. I try to brew a turbid mash lambic twice a year to keep a good stock for blending and fruiting. I also enjoy brewing historical and obscure styles. Otherwise, I like trying out different grains to see the flavor profiles. Always trying to find grains that will help build body into Brett beers. Brett can really chew up beers and leave them with a thin mouthfeel. Spelt (raw or malted) has proven great for this but malted rye and malted oats are great as well. Honestly, people need to play more with grains. Just no Hefes, please. If you could share a beer with anyone throughout history, of even fictional, who would it be? Anthony Bourdain, but he better take me to Thailand for real deal pho. Where do you spend your non-brewing time? Gardening and Vacation! New Zealand anyone!? Everyone should have a chance to drink German Pils made with Nelson Sauvin hops while down under. Who are your three favorite musicians/bands? Trent Reznor/NIN does that count for one or two? Pink Floyd and Nirvana.